We offer technical support by experienced and courteous web masters from the USA. Our web site design services include the latest technologies and trends for user usability and search engine optimizations. High traffic business web sites can rely on our dedicated or virtual private servers offerings. Customers can install reliable and trusted E-Commerce solutions with search engine visibility and without high monthly dues offered by other companies. We have teamed up with some of the best companies in the industry to provide well-rounded offerings for all levels of need. We provide managed support for your dedicated, virtual server or hosted application. 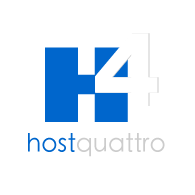 From the tech savvy, hobbyist, small entrepreneur or to the growing small business who would like to have a team of experienced web masters on a small budget, HostQuattro can provide cost effective solutions. We are very flexible with our offerings so see for yourself and try it for 30 days. No contract, cancel anytime. One time installation of a dynamic or static web script for a single domain. Direct contact with technical/designer leader via live-chat, helpdesk ticket and e-mail. Website and E-commerce maintenance service of a single dynamic web application/domain. 24 hour response time. Contact with technical/designer leader via live-chat, helpdesk ticket. Website and E-commerce maintenance service of a single dynamic web application. Less than 8 hours or less response time. Direct contact with technical/designer leader via live-chat, helpdesk ticket, and e-mail. Website and E-commerce maintenance service of a single dynamic web application and dedicated server. 15 – 30 minutes response time Direct contact with technical/designer leader via phone, live-chat, helpdesk ticket and e-mail.